I don't know whether you'll read this before or after our mandatory ride to South Dakota; but apart from the parousia or some major crisis, Rainmakers MC throttles off at 5:00 a.m. on 8/4. Parenthetically, Scratching the Surface (check out the preface and Genesis by clicking on the right column archives) begins big time when/if I return. Moretheless, trying to explain why we ride is like trying to explain a relationship with Jesus to someone who's never gotten beyond a religion about Him. 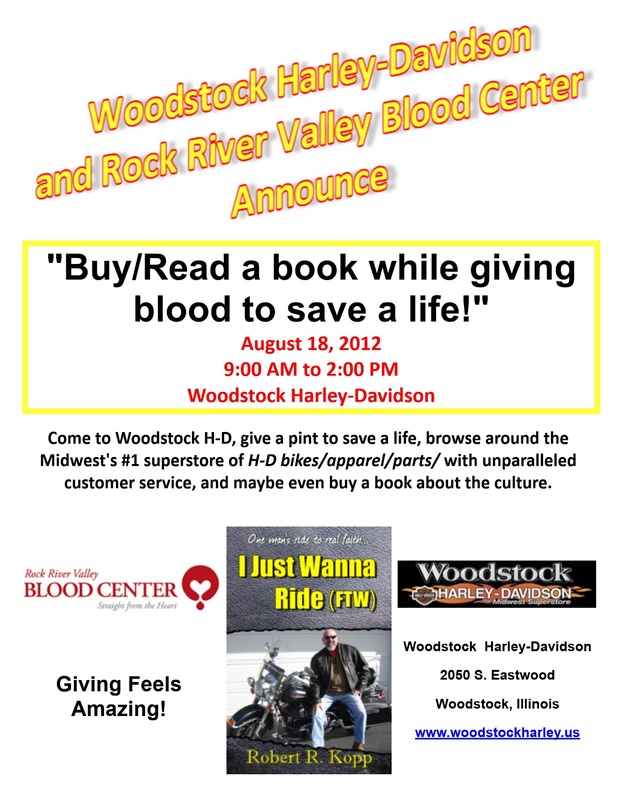 Be that as it is, you can still find out more about it by picking up a copy of I Just Wanna Ride (FTW) or hooking up avec moi on Sundays in Belvidere's FPC at 7:30 or 10:00 a.m or via www.bnnsradio.com or placing any of the following dates listed below on your calendar. With thanks to the "anonymous" author and apologies for taking advantage of that anonymity for anything that offends her/him, I've modified it a tad with italics to include a few inspirations/indigestions from someone who's just scratching the surface of his relationship with Jesus. I ride because it is pure fun; and I don't read anything in Holy Scripture that says He's the Source, Starter, Sovereign, and Savior of being cranky, contentious, creepy, or the death of the party for Him. I ride because I enjoy the freedom I feel from being exposed to the elements, and the vulnerability to the danger that is intrinsic to riding; which is part of the skull thing and reminds me of two billboards: "Think Before It's Too Late" and "Wake Up and Smell the Tyranny." I do not ride because it is fashionable to do so. I ride because it is natural and is what I have done all my life; and bikers really don't care what you think of 'em/us because you don't define 'em/us and you can/should read more about that in the book mentioned all over this website. My machine is not a toy. It is an extension of my being, and I will treat it accordingly, with the same respect as I have for myself; reminding me of an exchange between Jung and Freud. Jung: "Sigmund, you've said cigars are phallic symbols." Freud after taking a draw on his stogie, "Yes, but they're also cigars." I will learn everything I can about my machine, so that I am reliant upon no one but myself for its health and well-being; or as Jeff and I like to say, "Until we find someone who will care for our mules like we care for 'em, we'll care for 'em." I strive to constantly better my skill of control over my machine. I will learn its limits, and use my skill to become one with my machine so that we may keep each other alive. I am the master, it is the servant. Working together in harmony, we will become an invincible team; which sounds kinda sick unless you're, uh, a biker. My machines will outlive me. Therefore, they are my legacy. I will care for them for future bikers to cherish as I have cherished them, whoever they may be; bringing to mind that bikers can be as weird as anyone else. I do not ride to gain attention, respect, or fear from those that do not ride, nor do I wish to intimidate or annoy them. For those that do not know me, all I wish from them is to ignore me. For those that desire to know me, I will share with them the truth of myself, so that they might understand me and not fear others like me; which explains the acrostic in the aforementioned book. I will never be the aggressor on the highway. However, should others mess with me, their aggression will be dealt with in as severe a manner as I can cast upon them; which goes back to the skull thing and Ephesians 6:10ff. I will show respect to other bikers more experienced or knowledgeable than I am. I will learn from them all I can. However, if my respect is not acknowledged or appreciated, it will end; in a Golden Rule kinda way. I will not show disrespect to other bikers less experienced or knowledgeable than I am. I will teach them what I can. However, if they show me disrespect, they will be slapped; however, that slapping is His prerogative not mine. It will be my task to mentor new riders, that so desire, into the lifestyle of the biker, so that the breed shall continue. I shall instruct them, as I have been instructed by those before me. I shall preserve and honor traditions of bikers before me, and I will pass them on unaltered; which is another way of saying "we're" always just one generation away from extinction. I will not judge other bikers on their choice of machine, their appearance, or their profession. I will judge them only on their conduct as bikers. I am proud of my accomplishments as a biker, though I will not flaunt them to others. If they ask, I will share them in a Romans 12 kinda way. I will stand ready to help any other biker that truly needs my help; and read pages 103ff. in the aforementioned book for a revelation on that. I am not a part-time biker. I am a biker when, and wherever I go. I am proud to be a biker, and hide my chosen lifestyle from no one. I ride because I love freedom, independence, and the movement of the ground beneath me. But most of all, I ride to better understand myself, my machine, the lands in which I ride, and to seek out and know other bikers like myself. Absolutely! Romans 1:16-17 comes to mind! If I've gotta explain that to you, you wouldn't understand anyway. Having eyes and ears don't guarantee seeing and hearing spiritually. Not bad, try substituting disciple for biker and I think you have a fair presentation of the Christian life.